Currently Kimye, accompanied by their closest friends and family are all in Paris currently celebrating a special union that's soon to come. While everyone is trying to figure out what the bride will be wearing, there are some definite speculation that beloved designer Valentino Garavani created the gown for the future Mrs. West! After all, their wedding brunch and rehersal dinner was held in Valentino's French Castle. Kim and Kanye both looked stunning walking to and from their wedding festivities, wearing Valentino of course! 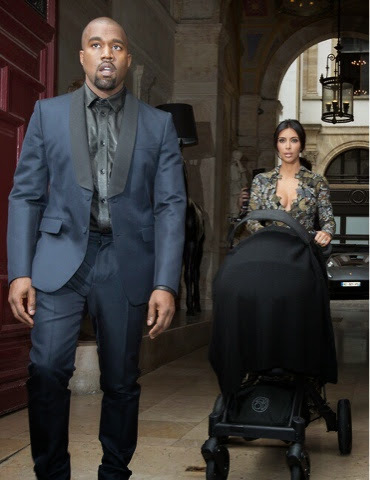 Kim wore a beautiful floor length gown covered in lustrous butterflies, while Kanye sported a navy blue suit partnered with a black button up and black shoes to their pre-wedding brunch. He continues to outdo himself since wearing a Lanvin suit to the Met Gala some time ago. Regardless of who makes the wedding gown, Kim's beauty wouldn't dare disappoint. As for Kanye, I'm sure he'll bring his "K" game right along with her.